Too late. We already have socialism for the rich, with the nuclear power industry as a prime example. On a level playing field, nuclear power would go bust. Those owners get financial supports or subsidies that safe renewables like solar power, geothermal, and wind power don’t get. Two particularly large government handouts keep the reactor business afloat, and without them it would crash overnight. 1) In a free market, the US Price Anderson Act would be repealed. The act provides limited liability insurance to reactor operators in the event of a loss-of-coolant, or other radiation catastrophe. The nuclear industry would have to get insurance on the open market like all other industrial operations. This would break their bank, since major insurers would only sell such a policy at astronomical rates, if at all. Even if the industry retained the above two subsidies, economists say the reactor business is finished. Jeremy Rifkin — the renowned economic and social theorist, author, political advisor to the European Union and heads-of-state, and author of 20 books — was asked his view of nuclear power at a Wermuth Asset Management global investors’ conference. “Here’s the issue: Nuclear power right now is six percent of energy of the world. There are only 400 nuclear power plants. These are old nuclear power plants. But our scientists tell us [that] to have a minimum impact on climate change — which is the whole rationale for bringing this technology back — nuclear would have to be 20 percent of the energy mix to have the minimum, minimum impact on climate change — not six percent of the mix. “That means we’d have to replace the existing 400 nuclear plants and build 1,600 additional plants. Three nuclear plants have to be built every 30 days for 40 years to get to 20 percent, and by that time climate change will have run its course for us. So I think, from a business point of view, I just don’t see that investment. I’d be surprised if we replace 100 of the 400 existing nuclear plants which would take us down to 1 or 2 percent of the energy [mix]. “Number 2: We still don’t know how to recycle the nuclear waste and we’re 70 years in. We have good engineers in the United States. We spent 18 years and $8 billion building an underground vault in Yucca Mountain to store the waste for 10,000 years, but we can’t use it. It’s already no good because there are cracks in the mountain. But any geologist could have told them we live on tectonic plates and you can’t keep underground vaults secure. “Number 3: We run into uranium deficits according to the IAEA [International Atomic Energy Agency] between 2025 and 2035 with just the existing 400 plants. So that means the price goes up. 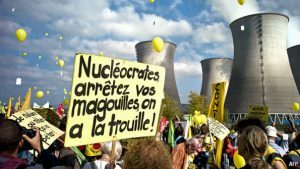 “Number 4: We could do what the French generation of new plants is doing and recycle the uranium to plutonium. But then we have plutonium all over the world in an age of uncertainty and terrorism. “Finally, and this is the big one that people don’t realize: We don’t have the water. Over 40 percent of all the fresh water consumed in France each year goes to cooling the nuclear reactors. It’s almost 50 percent now. When it comes back [when reactor cooling water is returned to the lakes and rivers] it’s heated and it’s dehydrating our ecosystems, and threatening our agriculture. We don’t have the water, and this is true all over the world. We have saltwater nuclear plants but then you have to put them on coastal regions and you risk a Fukushima because of tsunamis….